Preposition Examples are very important to learn English Grammar. 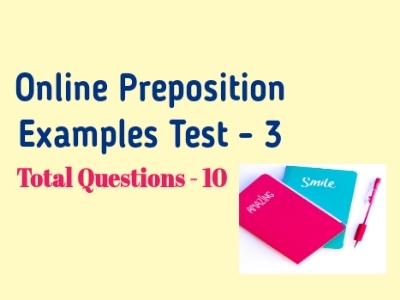 Here you attempt everyday Preposition Examples Test . If you want to learn Prepositions online, then you must visit our blog daily. If you are students or, Job Seekers, then this post is very useful to you. He threw a ball ___ the car. My mind is still ___ ease. He makes a living __ tuition. He is unfit ___ human consumption. ___ all his money he is not happy. She was dressed ___ silk. A book is divided ___ Chapters. The man died __ hunger.